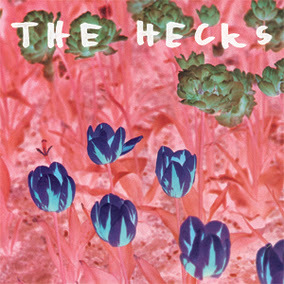 Few bands have as strong a first year as The Hecks, who took the city by storm opening for the likes of ONO and Black Dice while being named "Best New Rock Duo in 2012" by The Chicago Reader. For all the gigging and positive press, the band's only physical release was a split tape with Nonnie Parry on Exotic Aquatic. That changes next month, as Moniker Records is set to release Trust and Order, a 7-inch that offers listeners who lack a Walkman or Teddy Ruxpin the chance to enjoy The Hecks in the privacy of their own pajamas. Or someone else's. The snap of Zach Hebert's drums signals the start of "Trust and Order," a slow build of rolling snares, bustling maracas and peripatetic strings that pulsates in a field of almost limitless possibility. 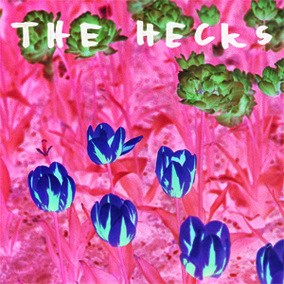 Akin to Sister-era Sonic Youth, The Hecks' approach to songwriting seems to be the stitching together of fascinating sounds- deconstructing pop-licks and moving them out of time or out of tune, creating something all-together more rewarding, or at the very least far more strange. Andrew Mosiman's luminous guitar leads push Hebert's percussion into a splashy frolic, galloping towards an implied explosion that seems almost interrupted by his own tar pit-drawl. The track avoids completely blasting off, instead coiling in tantrum before slowly unwinding into a meditation of fuzzy chords and soft pattering. This ability to keep an audience on its sonic toes is one of the band's true strengths, and it makes the record nearly as engaging as their frenetic live sets. Decidedly more jarring is the B-side, "The Time I Played With My Puppy," from whose hollow chugging and hillbilly rambling a violently mechanical riff is ripped. Riding Mosiman's acoustic persistence into the stratosphere, "Puppy" blooms into an airy collection of mellifluous flittering and corrosive static. On Trust and Order The Hecks sound like a confident band, maximizing the freedom of two players while setting themselves far apart from the staple garage romps that the term "rock duo" has come to suggest. This 7-inch should serve as much as a welcome introduction as it does a tease; one of the few downsides to Trust and Order is its brevity. Hopefully a full-length release isn't far behind. 'Trust and Order' is set for release on February 26th from Moniker Records. You can see The Hecks live with Mayor Daley, Skimask and Bugs and Rats on Friday, February 22nd at The Observatory ($5, 9pm). Check out "Trust and Order" below.